Oracle card reading is a beautiful and free flowing form of divination in which the reader connects with their intuition and psychic ability through the vehicle of oracle cards. It is a great tool for those just beginning to develop their spiritual gifts as well the more experienced practioner. Learn how to recieve personal guidance for yourself and others when you tap into the magic of your own intuition and connection to spirit by using oracle cards as a launching pad! The Winter Solstice or “Yule” is the shortest day of the year or "the longest night". We say good-bye to the darkness as we herald the joyous return of the Sun! It is a time to reflect on our endeavors and accomplishments of the year as well as what we would like to improve on in the next. Join me for an evening exploring the energy of the Winter Solstice, as well as a meditation to connect to this energy on a deeply personal level. Attendees will also receive a personal message at the end of the evening. 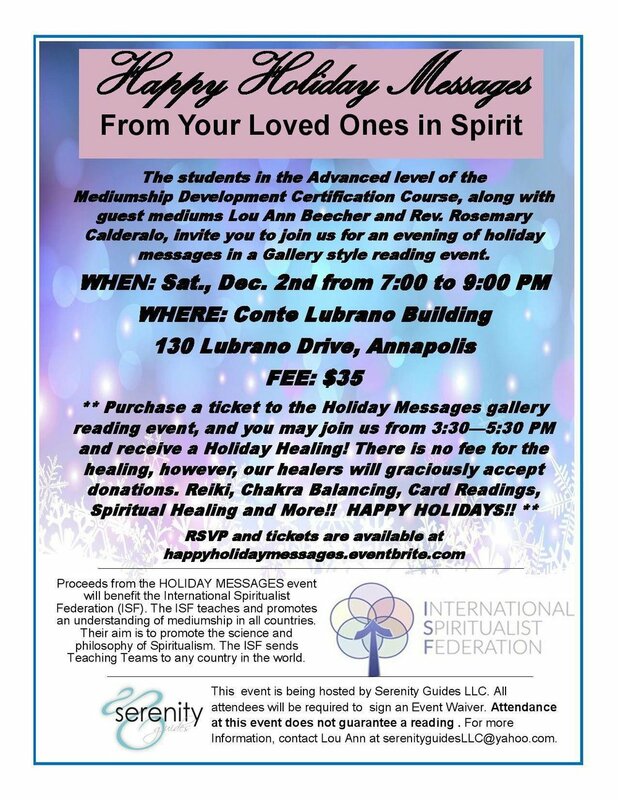 Join me for a New Moon in Scorpio Meditation at Nourishing Journey in Columbia, MD this Saturday! Unfortunately, my dear friend Nancy of La Luna Healing Arts will be unable to host this month, but I am happy to serve in her place. It is truly an honor and a pleasure. See you Saturday! In astrology, the New Moon is the moment when the old passes away and the new is ushered in. It is a powerful time for sending out your prayer, wishes, desires to the Universe! At the end of the meditation, everyone will receive a personal message! On All Hallows' Eve the veil is thin and we are more easily able to communicate with our ancestors and loved ones on the other side. Samhain, more commonly known as Halloween, is more than just a day of trick-or-treating, scares, and costumes. It is a time to go within, to connect with our shadow, and to honor our ancestors. Gather together on All Soul’s Day to embrace the spirit of Samhain as we learn about it's origins and traditions. We will also have a meditation to look behind the veil and connect with our ancestors. Have you always wanted to learn to read the Tarot, but don’t know where to start? Are you overwhelmed by trying to memorize 78 card meanings? Relax and let your intuition guide you in this Intuitive Tarot 101 - 2 Day Intensive! Learn to tune in to your natural intuitive gifts to create more fluidity in your Tarot readings. As a self taught Tarot Reader, I know how mind boggling it can feel trying to learn the Tarot. If that experience taught me anything, it’s that books are great as a reference but each Tarot reader is different and therefore reads differently. In my experience, learning to read the Tarot is not a cookie cutter thing. This workshop is all about connecting with how YOU read Tarot in a way that is natural for you using the gift of your own intuition. Using your Intuition to help you remember the card meanings! Required Materials: Please bring a notebook, pen, and a copy of the Rider Waite Tarot deck (in the yellow box). Also, please bring a lunch with you or a snack. Register before September 30th! Full payment due by October 3rd. *A $50 non-refundable deposit is required due to limited seating. To Register, send your deposit to PayPal.me/mavenunmasked/50 before September 30th with a note that this is for the "Tarot Intensive" along with your email address to receive directions to the workshop and an invoice to pay the balance. Payment in full due by October 3rd. This 4 class series will take you through the magic and wonders of the four elements: fire, water, earth, and air. Learn about the wisdom contained with in each of these elements of nature. This class will help you to recognize the role that the elements play in your every day life as well as help you connect to them on a more deeply personal level. We will also journey to meet each of these elements in meditation. Please bring a journal with you if you wish to take notes. Create a spiritual oasis in your own home! A sacred space is a place where you come to relax, gain clarity, connect with yourself, and with your spirituality. Have you been looking for a way to bring more of your spiritual personality into your sacred space? Looking to manifest more love and prosperity? Perhaps you're looking to create a place of peace in your home for deeper connection to your spirituality and the Divine? Are you intimidated by making your spiritual practice more unique to you and are unsure of where to start? This workshop will provide tons of tips, guidance, and instruction on cultivating a spiritual sanctuary tailored specifically to you and your needs. In this workshop, we will cover 6 themes for a sacred space, including altar creation! From candles and clearing the space, to angels and crystals - this workshop has it all! We will be working with the energies of 4 high vibrational angels, guides, and goddesses who offer their wisdom to support us in facing our fears, connecting with the Earth, and overcoming challenges that may be hindering our receiving of abundance. The identity of these guides will remain unknown to attendees until the night of the circle, which is why we ask that you register in advance. Under the full moon, you will learn about different angels, guides, and goddesses as well as different ways to work with their energy outside of the workshop. You are welcome to bring a notebook and pen if you wish to take notes during the circle. Investment for this circle is $20. Please send payment before April 9th to: https://www.paypal.me/mavenunmasked When sending payment, please note "For Moon Circle on April 9th"